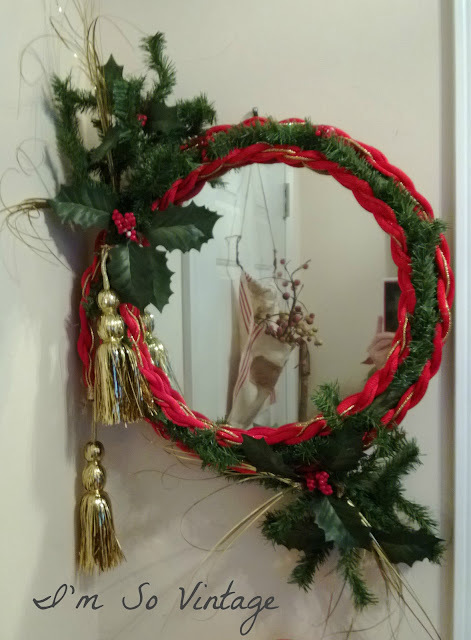 It has been a lot of fun decorating my mom's house for Christmas this year, and even though it is not the way I would normally decorate my own home, I have really enjoyed doing it. I'm more of a natural color kind of girl. I thought it would be fun to share some of the whimsical elements, today. 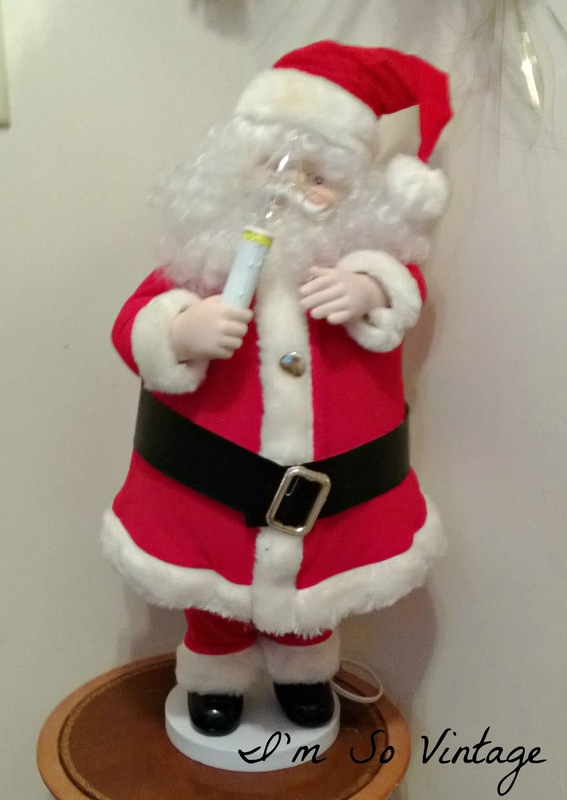 Santa greeting visitors at the front door. 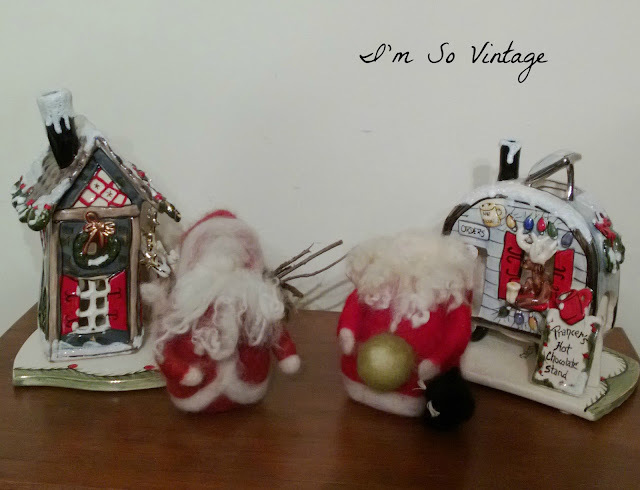 Two Santas that I needlepointed for my sister and mother several years ago. Santa overlooking one of the houses in the Christmas village. 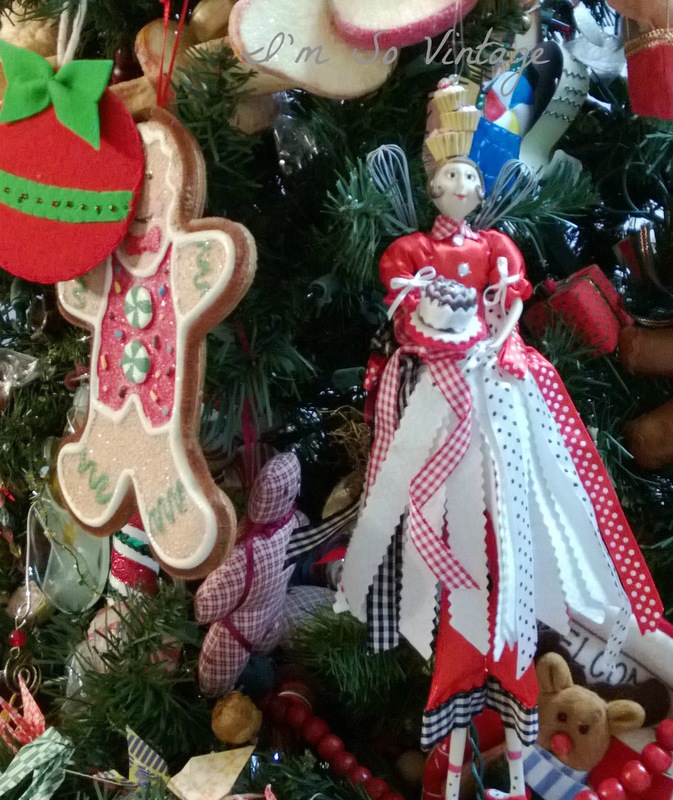 and more of the kitchen tree. I hope this Christmas season is a whimsical one for you. In many respects I feel like I have been transported back to childhood, a time that was magical and filled with warm homey feelings. Laura, I just read many of your blog posts so I could catch-up to see some of the challenges you have been facing. It sounds like you are moving forward. 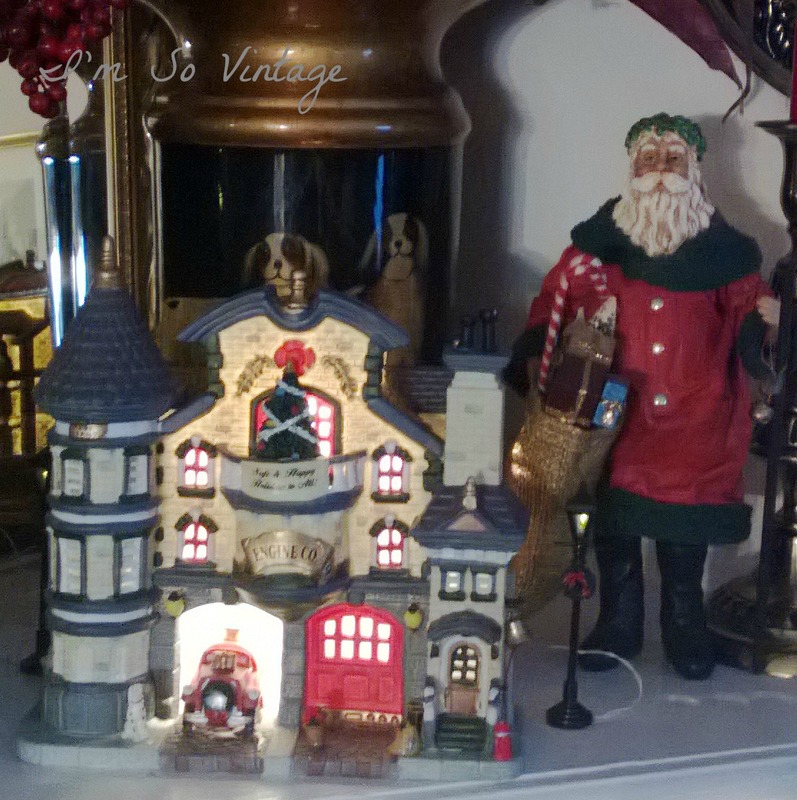 I wanted to stop by and say congratulations on being featured at Brenda's Cozy little house! I love your old picket fence with the vintage photos. I hope being featured makes your day. Can't wait to see all the wonderful things that you will create in the coming year! Wishing you a very Merry Christmas filled with more blessings! It's fun to put out Christmas decorations that remind us of our childhood! I am so glad you seem to have found some peace! Wishing you a wonderful week! Lovely Christmas decorations! Love what you did with the mirror! What a wonderful gift for your mom. My own mom loved a real tree every year and was never without one. My mother gave us one of those lighted, moving Santas years ago. I'm afraid he hasn't left our attic in a long time. Still, sometimes the old things are comforting and really say "Christmas." Merry Christmas, Laura! Laura, you are so right...I'm loving all the whimsy I'm seeing around blog land. It's so cheerful and fun and we all need that right now. Great job...you and your Mom enjoy it! May whimsy follow you into the new year and stay with you the whole year long, Laura. The red, greens and gold’s after fifty years of making the holiday happen still move my soul. Choose joy . . . I feel the same too. Enjoying it! Oooooh, I want that Christmas mirror! :D How cute. I love that first Santa holding the candle!